Use a lamb's wool applicator or synthetic wax applicator to apply. Pour wax into a paint pan, dip your applicator, then squeeze out the excess or wipe sideways on side of paint pan. Apply in thin even coats. Work out pinholes and puddles. Allow to dry completely clear and non sticky between coats. 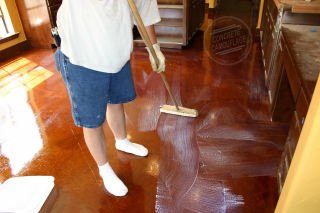 After final coat, allow to cure a minimum of 1 hour after drying, though overnight is best, before allowing foot traffic. We recommend that you initially apply 2 thin coats for typical residential and 4 coats for homes with dogs and heavy commercial use areas. Then apply single coats as needed for maintenance. Do not apply when humidity levels are above 65%. Usually lasts several months before showing scuffing or dulling, but when it does start to scuff or dull, just clean, allow to dry, and reapply a fresh coat of Top Shield Wax. Tip. You never need to use a buffing machine with this wax. Although it is designed so that you can use a machine if you like. Tip. 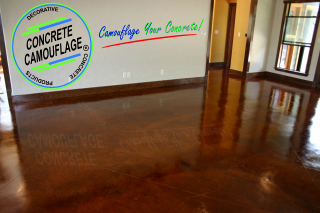 If staining an extremely smooth concrete slab, you still should seal it before waxing. Tip. 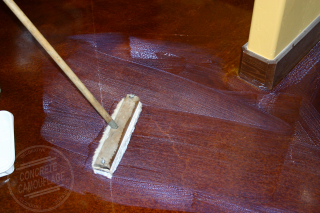 Standing water for an extended period of time can occasionally cause the wax to look cloudy. Allowing the area to dry out will let the wax go back to it's clear and glossy look on it's own. Tip. Although the wax is U.V. resistant, it will not hold up to chemicals, such as gas, oil drips, paint thinners, or heavy cleansers like ammonia. That is why we recommend the wax for indoors only. However, we have many many customers whom have chosen to use the wax outdoors on patios, porches, walks, pool decks, and even driveways. They've given us very positive feedback and strongly suggested we begin recommending it for exterior as well as interior. Tip. We do not recommend using grip additive in the sealer when you intend to wax the surface, because the sandpaper type texture of the grip makes it difficult to apply the wax evenly. Though it can be done. Besides, the wax is less slippery than sealer. Clean with water. You can use a mild dish detergent if needed, such as Dove or Ivory. Do not use Dawn or harsh cleaners such as Simple Green or cleaners with ammonia. Can be easily stripped off with our Wax Remover.